The air at 20,000 feet above Schweinfurt, Germany, was icy cold, but the bombardier crouching in the nose of the B-17 hardly noticed. Sweat poured down his forehead as flak rocked the aircraft, periodically spattering his compartment's Plexiglas bubble with fragments. He focused intently on preparing for the final bombing run. He bent over the Norden bombsight, making adjustments with one gloved hand, his other hand grasping a dog-eared booklet filled with numbers—the precise settings he needed to punch into the bombsight to ensure that the B-17's load released at the exact moment necessary to hit its target. 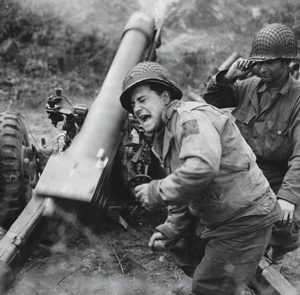 On the ground, artillerymen such as these firing a 105 mm M2A1 howitzer at Carentan, France, counted on the PCS's charts to account for the effects of range, elevation, muzzle velocity, weather, and other factors on the trajectory of their shells. Ten thousand miles away, a Marine sergeant stood next to a 75-millimeter M1A1 pack howitzer on the beachhead of a tiny Pacific Island, surveying a battalion of American soldiers preparing to charge a Japanese hillside position. But before the Marines could advance, the heavily dug-in enemy artillery atop the hill had to be silenced. Ignoring the bullets peppering the sand around him, the sergeant read out a series of numbers from a small chart he held, sending his gun crew scrambling to zero in on the Japanese positions. Both the bombardier and the artillery sergeant depended on the accuracy of the figures they fed into their weapon systems. If the sergeants had known where those numbers had originated, they probably would have been astonished. The data were the work of a group of remarkable women with a flair for mathematics who were employed by the Army: the Philadelphia Computing Section (PCS) at the University of Pennsylvania. Known as "computers" in an age when that term referred not to machines but to human beings, some of the women went on to help create the first electronic computer, ENIAC. Like the legendary Rosie the Riveters, who toiled in factories and war plants, they were also vital to the war effort, but these computing Rosies worked in secrecy and anonymity, their contributions still largely unknown and unrecognized today. 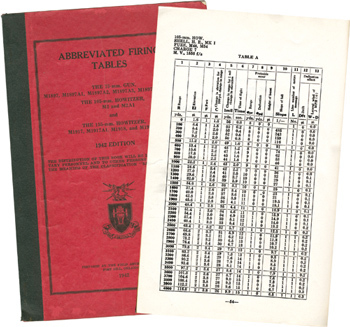 The "computers" of the Philadelphia Computing Section solved many thousands of complex mathematical formulas to determine accurate artillery shell trajectories, information published in firing table guides, above, that were used by servicemen in combat. Math helped propel the military's technological gains of the 20th century. In previous centuries, warfare was literally a hit-or-miss affair. Especially at distances beyond a few feet, weapons were mostly inaccurate, clumsy, and inefficient. Whether aiming a musket across a battlefield or a cannon across the water, a soldier or sailor essentially pointed in the general direction of the enemy, fired, and hoped for a hit. War was also up close and personal: soldiers fired only at what they could see directly. Technological warfare opened the possibility of striking at what one couldn't see—landing an artillery shell on a hidden target over distant hills or dropping a bomb from a high-flying aircraft required firing tables with the correct trajectories, drop points, elevation angles, and muzzle velocities. These calculations also needed to take into account the constantly changing variables of temperature, air density, wind drift, and target position. 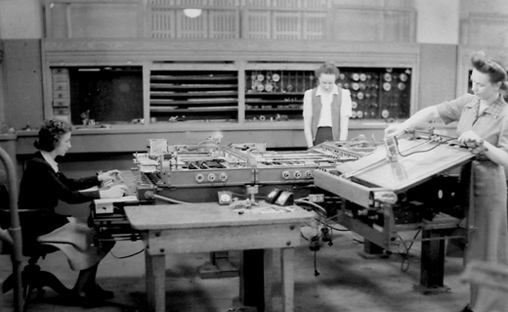 In addition to hand computing on paper, Kay McNulty, Alyse Snyder, and Sis Stump, above, operated a Bush differential analyzer machine, a mechanical calculating machine developed in the 1930s, which helped crunch the enormous amount of data that went into establishing range projections for a variety of different field artillery pieces. Even before World War II, the Army was busily perfecting an arsenal of new artillery and infantry weapons at its Ballistic Research Laboratory at the Aberdeen Proving Ground in Maryland. To develop the crucial data to operate those weapons, engineers crunched numbers with a Bush differential analyzer, a 30-foot-long mechanical calculating machine developed by MIT's Vannevar Bush in the early 1930s. A cadre of human computers also worked at calculating figures and compiling tables, using pencil, paper, and adding machines. But when America joined the conflict in 1941, the demands of total war forced the Army to enlist more help, and the lab commandeered the resources (and the additional differential analyzer) of the University of Pennsylvania's Moore Engineering School. That meant that a new corps of "computers" had to be assembled quickly to help process the data. With most able-bodied young men already serving in uniform, the Army sought out the most immediately available mathematical talent: young women with a gift for numbers. Principals from many high schools received an SOS from the military, remembered Doris Blumberg, who, along with her twin sister, Shirley, was about to graduate from the Philadelphia High School for Girls in May 1942. "The principal called us in and said that they were recruiting women to do mathematical work at the University of Pennsylvania for the war effort, and that we were qualified." Both girls believed it was their duty to do their part. For young women in the 1940s with a love of math and science, the PCS work represented an unparalleled opportunity. "If we went out and tried to get some other job between high school and college, it would be a dull kind of a thing, so we may as well go into something that is interesting," Doris said. Under the direction of Capt. Herman Goldstine, the research lab mathematician in charge of the PCS, the Army brought scores of young women to the university, mostly from the Philadelphia and Baltimore area at first but later from New York, New England, and the Midwest. The recruits dove right in, learning the specialized mathematical differentiation and integration techniques involved in ballistics calculations. "It's advanced mathematics," Shirley Blumberg explained. "Equations were solved in order to figure out the trajectory of a bullet or a bomb; just exactly where it started; what the muzzle velocity was of whatever was shooting this bullet; and where it was going. We knew the distance, and we had to figure out how it was going to get there, exactly where it had to land. The differential equations were part of the solution of the trajectory... We knew that's what we were hired to do, to create this book that was going to be distributed to the guys who were shooting the guns. They were going to use these tables to figure out how to hit a particular target." Goldstine's wife, Adele, also a gifted mathematician, was among the instructors, as was Mary Mauchly, married to Moore School professor John Mauchly—who would soon help initiate another secret war project. Working out of a former factory and neighboring fraternity house, the women would be given different assignments to create the table for a particular weapon," explained LeAnn Erickson, a filmmaker who details the story in a documentary. They were well paid, particularly given the era and their gender. The long hours (they sometimes worked two eight-hour shifts) and the sense of shared purpose helped the women bond. During their off hours, they picnicked and went to dances and movies; some dated whatever men were left behind by the war. Wartime secrecy regulations required that their superiors tell the Rosies little beyond the minimum necessary to do their jobs. "We did not know where these tables were going to be used," Shirley said. "We knew that they were going to be used in Europe, but we had no idea exactly where. We found out later, when we read the newspapers, where the big battle was. And we realized that some of the information—maybe all of the information they had on the tables—we developed in our office." They understood, of course, that their calculations would be used ultimately to kill other human beings, but most didn't dwell on any moral qualms until much later. Occasionally, though, they could- n't help but consider the realities of their work. One such occasion occurred in spring 1944 after the bloody landings at Anzio, Italy, during which the Allies attempted to capture Rome by outflanking German forces with an amphibious attack. "We had some big shots in Washington come up in military uniforms to give us an award," Shirley recalled. "They came in and stopped our working and said there was a presentation to be made. And this general got up there and told us how valuable our work is, and we were doing such a great job for the war effort... and that the landing on the beach at Anzio was a great success. And therefore, we're getting this big award for doing that wonderful work that made it such a success." For Shirley and most of her co-workers, it was merely a distraction: "We were in the middle of working. Let us finish what we're doing." Later, however, she had second thoughts. "When I read about the bloodbath on the Anzio beaches in the newspapers, I got physically ill."
Doris had a similar experience when the Rosies were asked to create data for the invasion of Guam, where Japanese troops "were in trenches all around the island." She recalled discussions with their supervisors about different formulas to be used for computing shell trajectories depending on whether a Japanese soldier was standing or was lying flat in a trench or on the ground. "That kind of got to me... because it made it more personal. I thought, 'My god, what are we doing here?'" The work continued, even after V-E Day saw the Rosies dancing in celebration in the gardens on the Penn campus. John Mauchly and J. Presper Eckert were already secretly setting the stage for the first great leap beyond human computers and mechanical differential analyzers to the first electronic computer: the Electronic Numerical Integrator and Computer, or ENIAC. The women heard rumors about an interesting project at the Moore School, but they didn't know any details. "We knew that these two guys were in this room right off the differential analyzer room, and that they were inventing something," Shirley recalled. "But we had no idea what they were inventing until much later. They invited a couple of us in there and said, 'Do you wanna see something?' They had this great big machine up against a wall and lots of lights and wires coming to it. And they took us in, and we said, 'What's that?' And they said, 'That's going to be the first electronic computer. That's going to do the work that you're doing in seconds.' We said, 'Yeah, go dream on, you crazy guys.'" By June 1945, Mauchly and Eckert were ready to get ENIAC up and running, and they turned to the computing Rosies to help operate or, as it would soon be known, "program" the machine. Betty Jean Jennings, a math major from rural Missouri who had joined the PCS that spring, attended a meeting for potential programmers. "They didn't know what to ask us, basically," she said. "I remember Herman [Goldstine] asking me what I knew about electricity. I said I had had a course in physics and knew E = I/R. He replied what he really wanted to know was, 'Are you afraid of it?' I replied that I wasn't." Six women—Jennings, Kathleen (Kay) McNulty, Frances Bilas, Elizabeth (Betty) Snyder, Ruth Lichterman, and Marlyn Wescoff—from the PCS were selected to join the ENIAC project and went to Aberdeen for several weeks of training. Although they had already been doing secret work with the PCS, they weren't even permitted to see the finished machine until the government had approved higher security clearances for them. Frantic preparations were under way for the computer's public unveiling, but in the meantime it remained top secret. Kay McNulty remembered, "Somebody gave us a whole stack of blueprints, and these were the wiring diagrams for all the panels, and they said, 'Here, figure out how the machine works and then figure out how to program it.' This was a little bit hard to do." They studied the intricate circuitry, wiring, logic, and operation of ENIAC, a 27-ton behemoth with almost 18,000 vacuum tubes, thousands of other parts, and miles of wiring. After finally meeting Mauchly, they fired questions at him as they worked to develop the computer's programming. "Occasionally, the six of us programmers all got together to discuss how we thought the machine worked," Jennings recalled. "The biggest advantage of learning the ENIAC from the diagrams was that we began to understand what it could and could not do. As a result we could diagnose troubles almost down to the individual vacuum tube. Since we knew both the application and the machine, we learned to diagnose troubles as well as, if not better than, the engineer. By the fall they were preparing a demonstration program on how to compute a shell trajectory. Before that happened, however, two scientists arrived from Los Alamos to give ENIAC its first real-world problem to solve. Theoretical work on the hydrogen bomb had been under way at the lab for some time and continued after Japan's surrender. In October 1945 Stanley Frankel and Nicholas Metropolis decided to use ENIAC to explore how an atomic bomb could trigger a thermonuclear reaction. It was all top secret, of course, and Frankel and Metropolis brought their own program with them to Philadelphia on a million IBM punch cards. But the women were essential to running the program and operating the machine. "The day we were going to put it on the machine is the first time we saw the ENIAC," Jennings recalled. "Herman Goldstine acted like the conductor of an orchestra and stood in the middle and said, 'Accumulator 1, Switch 1, set to Alpha Input,' you know, 'blah, blah,' and he was reading from their description. That was our first hands-on experience with the machine." ENIAC was set to be revealed to the public in February 1946. "About two weeks before the public announcement of ENIAC," remembered Jennings, "Herman and Adele Goldstine asked us if our trajectory program was ready to go. We said it was. They asked if we could have it up and running for the demonstration at the announcement. We said it could." The program, however, hadn't actually been tested, and although Jennings and her partner, Betty Snyder, were fully confident, no one could be sure until ENIAC had been taken through its paces. The women worked days, nights, and weekends to get ready. John Mauchly shared a bottle of apricot liqueur with the programmers to wish them luck. Then, the night before the public demonstration, they hit a snag. "The trajectory program was running perfectly, except it didn't stop computing when [the shell] was calculated to hit the ground," Jennings said. "It kept going. Betty and I checked and rechecked everything until about 2 a.m. We couldn't figure out what on earth was going on." She credited Snyder with finding the answer. "I've always said that Betty uses more logic in her sleep than most people do awake. We used to have a problem and she'd come in the next morning and say, 'I was thinking, you know, maybe this,' and usually she was right. Well, that night she had her nighttime logic working. She came in the next morning and flipped one switch on the master programmer and the problem was solved." ENIAC's coming-out party before scientists and the press proved a huge success. The women, however, soon found themselves shunted aside from sharing in that success. "You can see them being dismissed almost immediately," noted historian Nathan Ensmenger of the University of Pennsylvania. "They have a dinner in which they ask all the university bigwigs and military people and all of the men, and none of the women are invited." Historian Jennifer Light of Northwestern University concurred: "Newspaper accounts characterize ENIAC's ability to perform tasks as 'intelligent,' but the women doing the same computing tasks did not receive similar acclaim." A New York Times account of the demonstration marveled at how ENIAC solved a difficult problem in 15 seconds, she pointed out, while ignoring the many hours that the women spent setting up the problem on the machine. Nowhere is this discounting of the women's contributions more evident than in the photographs that were used to publicize ENIAC. The first public photo appearing in the New York Times was a wide shot, showing both men and women working on the machine at various panels throughout the enormous computing room. Yet when the photograph was reprinted elsewhere, the women were usually cropped out. This was most obvious in an Army recruiting ad that appeared in various magazines later in 1946. Calling for "men with aptitude for scientific work" and extolling ENIAC as a prime example of "many amazing Army devices," the ad featured a heavily cropped version of the original Times photo, with only a single man shown working at a control panel. The message was clear: women need not apply; computers are for men. Ensmenger and other historians cite "old-school sexism" for this prejudice. The disregard for women also signaled the beginning of the evolution of computer programming from a relatively unskilled clerical, "feminized" activity to a more technically skilled, supposedly more "masculine" pursuit. "Early computer programmers were women and were imagined to be fairly low skilled," Ensmenger observed. "But today, if you were to think about a computer programmer, at least that kind of stereotype would be almost exclusively male, a male of a very particular type"—the classic nerd with pocket protector and thick glasses. That stereotype developed slowly over the 1950s and 1960s. "I do think that, although people like Eckert and Mauchly probably recognized the women to a certain degree, at this point they still saw what they did as primarily clerical." To those with this perception, inviting the women to a celebratory dinner or anniversary celebration for ENIAC would be "like inviting the janitorial staff." And even the nature of early computing technology itself helped to perpetuate such unique in that it was programmed like a switchboard," Ensmenger continued. "It looked like a switchboard. [The programmers] looked like telephone operators, which by that period is completely feminized. So in a funny way, if it had looked different, it might have been thought of differently." Because their story has lurked in the shadows until now, historians and others are still debating the ultimate influence of the Rosies on younger generations. But their contributions in World War II and to postwar computer science are clear. "I think they certainly showed that women were capable of doing science and making contributions to technology, which was, in terms of the 20th century, a real question for women," said historian Kathy Peiss of the University of Pennsylvania. The Rosie the Riveters in the factories and war plants may have built the planes, tanks, and guns, but it was the math-savvy, top-secret, white-collar Rosies of the PCS who helped make it possible for those weapons to win the war.